Samsung Electronics Vice Chairman Lee Jae-yong, the de facto leader of South Korea’s top conglomerate, Samsung Group, met recently in Abu Dhabi with Crown Prince Mohammed bin Zayed Al-Nahyan to discuss cooperation between Samsung and UAE companies, according to industry sources on Tuesday. 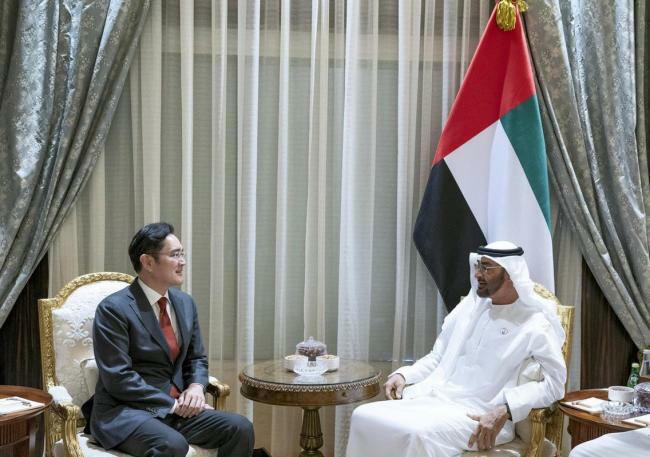 The meeting between the Samsung heir and the crown prince of the United Arab Emirates was held Monday, a day after World Government Summit 2019 kicked off in Dubai. Lee did not officially participate in the summit, according to Samsung. The Samsung chief discussed various ways in which Samsung could cooperate with UAE IT businesses, a company official said. Lee, who left Seoul on Feb. 4 to check a Samsung memory plant under construction in Xian, central China, headed to Geneva before visiting the Middle East. “The vice chairman will be dealing with some personal schedules overseas, which can’t be confirmed,” a Samsung official said.